I signed up for a Hotmail email address when I first got access to the Internet about 15 years ago. It wasn’t a great service, but it worked. I gave up on it after a while – Gmail was better, after all – but I still logged in every now and then just to make sure old contacts weren’t trying to reach me. And now Hotmail.com has officially ceased operations. The site now redirects to fellow Microsoft email site Outlook.com. All Hotmail emails and contacts still exist; they’ve just been transferred to a different place. A much more powerful, user-friendly place, or so the TV commercials for Outlook claim. You’ve probably seen those commercials, right? The ones set to the Mackelmore and Ryan song where busy people take an inbox full of unread messages and, with the press of just one or two buttons, achieve the magical goal of “inbox zero.” It all looks great on the television screen, but is the new Outlook really that terrific? In short: Not quite. But Outlook does offer huge advantages over the old Hotmail. It even does a couple of things better than Gmail. Let’s take a look. 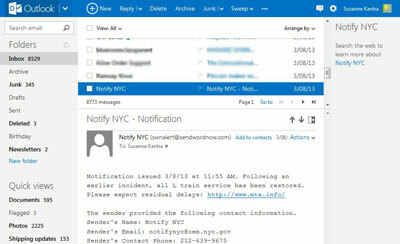 The new Outlook design is great – far superior to the outdated feel of Hotmail. The screen isn’t cluttered with nonsense. It’s simple, clean, and easy to use, not unlike Gmail. At the left hand of the screen, you’ll notice your Folders and Quick Views. Folders work much the same way they do on Gmail. Quick Views automatically classifies your emails in categories based on their contents, such as Documents, Photos, and Shipping Updates. It’s a good way to provide quick access to the important stuff you anxiously check your email for. At the top of the screen is a blue menu bar. That’s where all the good stuff happens, so to speak. When you click an email, that’s where the familiar Reply, Delete, and Move to commands appear. You’ll find your contacts (called People) hiding under the Outlook logo in the top left-hand corner of the screen, along with links to some of Microsoft’s other properties. Outlook allows you to add people to your contacts pulled from Facebook, Twitter, LinkedIn, and other social networking sites. Sweeping is one of the most talked about features of Outlook.com – you’ve probably even seen it featured in one of Microsoft’s TV commercials. It’s a simple and useful tool that allows you to set up rules for the automatic deletion or filing of emails. You’ll find the Sweep feature in the top blue menu bar on the Outlook page once you’ve clicked or opened an individual email. Unsubscribe is probably one of my favorite Sweep options. Clicking it not only deletes the email in question, but also sends a request to the company that messaged you, automatically asking it to remove you from its mailing list. If the sender refuses the request, Outlook will automatically put all their emails into the Junk folder. Given how notoriously unreliable unsubscribing from email lists used to be, this Outlook option is a godsend. Just as powerful is the Schedule Cleanup option. It allows you to tell Outlook when you want emails from a certain sender deleted or moved. You can choose to keep only the last email from a sender, or choose to keep mail for ten days after it was sent. When I scheduled cleanup for my Groupon emails, I was offered the ability to also delete all emails of a similar type, such as those from Barnes & Noble. Doing so quickly cut my inbox down from an unmanageable 25,100 unread emails to a slightly less unmanageable 20,800 unread emails. That was the quick hit – getting rid of the next 1,000 emails took an unfortunate amount of tedious clicking and calling out senders individually. I really like the new Outlook. It’s far better than Hotmail, and one could argue that it’s as good or better than Gmail. But at the end of the day, Outlook is just an email provider. There are plenty of useful tools, but if you’re hoping for a magic bullet, you’ll be sorely disappointed. Keeping things organized still requires a lot of work, but Outlook at least makes that work easier. For all those who are complaining about hotmail/outlook… keep in mind that it’s one of the few domains left that is NOT SCANNING YOUR CONTENT (in the supposed name of ‘marketing’). I’m tickled PINK-a-rama to be back w/ Outlook. I’m LEAVING YAHOO! ...and comin’ home, baby. ...and it’s PRIVATE!! The way mail was supposed to be back before CyberMania made us FORGET ABOUT PRIVACY!!!!!!! I’m back, baby…and LOVIN’ every minute of it! KEEP UP THE PRIVACY FACTOR and we’ll always come back! Finally, Microsoft’s big step in re-branding Hotmail to Outook.com. So many lots of improvement in Hotmail, Interface changed a lot and everything is made easy now. I just really loved the new Outlook UI. Its been a long since Microsoft made this change, Since that time, Outlook.com is making more changes and offers more features for their users. IT has been long time microsoft made these chnages and also windows os has been loved omly by feww people only.